DARK HORSE is an inspirational and life-affirming true story set in the village of Cefn Fforest in one of the poorest mining valleys in Wales. The story begins in early 2000, when Jan Vokes, the barmaid of the local working men’s club, hears a regular talking about the time he owned a share of a racehorse. Walking home that night, Jan has an idea. She’d bred pigeons and whippets before, she thought. How hard could it be? She decides she’s going to take on the ‘sport of kings’ and breed herself a racehorse. Jan recruits her husband, Brian – a former coal deliveryman and nightclub bouncer – and the regular, Howard, who was reminiscing about his racehorse in the bar. Together they buy a £300 thoroughbred mare – possibly the slowest racehorse in Wales – pair her with an ageing stallion (discount stud fee: £3,500 + VAT) and raise the foal on their slagheap allotment. They name him Dream Alliance after the 23 friends from the village Jan cajoles into a forming a syndicate paying £10 a week. To the astonishment of the racing elite, Dream becomes an unlikely champion, leaving his blue-blooded rivals standing. Until one day, running in a race at the famous Aintree racetrack, he suffers a potentially fatal injury. His owners refuse to let him die. By now Dream is a local hero and genuine source of hope and inspiration in the valley. Instead, his owners pour their winnings – £20,000 – into high-risk, revolutionary stem cell surgery. 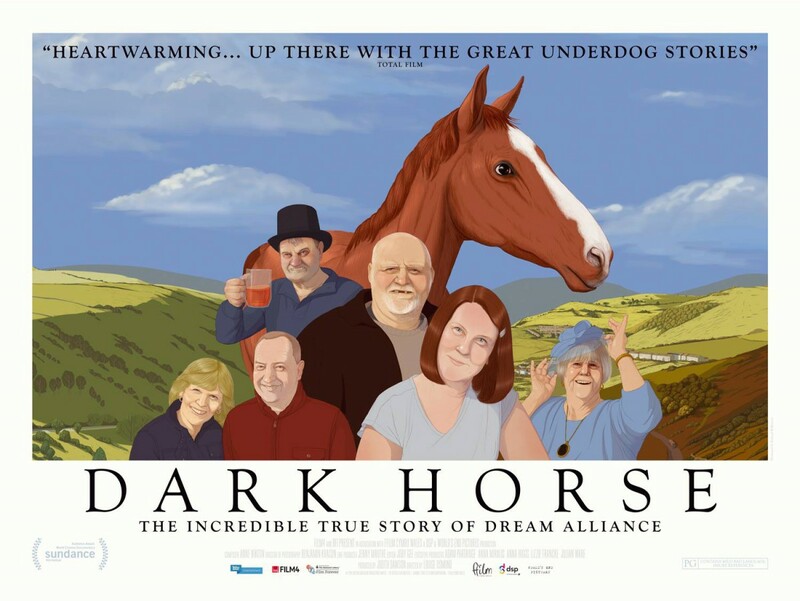 Dark Horse is now being shown in the U.S.
See the website link below for Theater dates.